"It was better than 'The Empire Strikes Back' and 'Star Wars' — at least I think so." Prime Minister Justin Trudeau's love of the "Star Wars" film franchise is no secret. For Halloween, he dressed as Han Solo, while his wife Sophie Grégoire-Trudeau went as Princess Leia. And he was giddy when he spotted the R2-D2 jet at the Vancouver airport during the election campaign earlier this year. 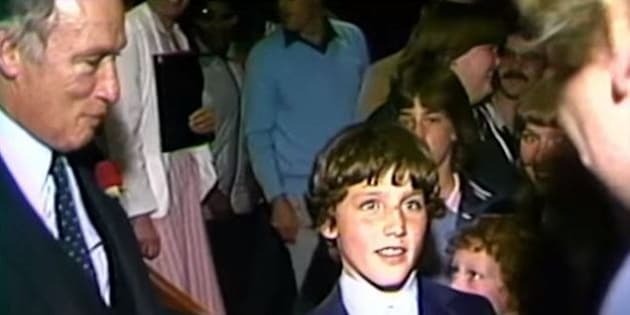 Now, the folks at CBC Archives have uncovered a classic clip of an 11-year-old Trudeau leaving an Ottawa screening of "Return Of The Jedi" with his dad and former prime minister Pierre Trudeau. The junior Trudeau told the reporter: "It was better than 'The Empire Strikes Back' and 'Star Wars' — at least I think so." But time may have tempered that initial reaction. In a Q&A, Trudeau told The Huffington Post Canada in October that he prefers, in order, episodes "5, 4, 6, 2, 3. Too bad there was never a 1 made." And on Monday, the prime minister acknowledged on Twitter, "When I was a child, I spoke as a child," pointing out his preference for "The Empire Strikes Back." We'll check back with the PM if that changes once he sees "The Force Awakens."